If you’re hosting a party for those in the recovery community, or you’re trying to make the most out of your wedding as a pregnant bride, there’s plenty of reasons to plan an alcohol-free event. 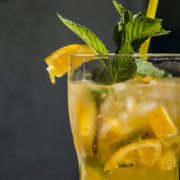 Though most people assume that parties need to have some sort of alcohol available if they’re going to go off without a hitch – the truth is that there’s a range of delicious mocktails out there that can provide the same sense of luxury – without the hangover. Following are just some of our favorite recipes designed to keep your bar inspirational, and your guests happy. To make this brilliant beverage, combine the blackberries, syrup and juice in a cocktail shaker and mix well. Add ice and shake vigorously for at least thirty seconds, before straining into a cocktail glass. Garnish with extra blackberries for an additional ounce of flair. Pour the soda, lime juice, and grenadine into a large mixing glass and stir until all of the ingredients are fully combined. Pour over plenty of ice in a low ball glass, and garnish with cherries. 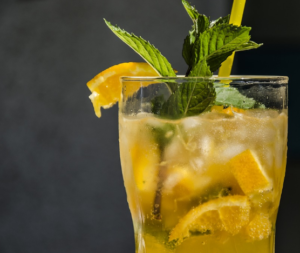 This particular mocktail doesn’t require any professional mixer knowledge. Simply toss all of the ingredients into your biggest, fanciest pitcher and serve ice cold to your guests. Combine all of your ingredients into a glass and stir together well. If you want to save time, you can use a pitcher instead – just be sure to garnish each glass you serve with a small slice of ginger, and a sliver of lime. Place the sugar, lemon juice, water, and coconut water into a pitcher and mix well until all of the sugar granules dissolve. Pour your lavender syrup into the concoction, and stir well for one of the prettiest mocktails you’ll ever see. In a small pitcher, mix your frozen lemonade with three cups of water. Fill an ice cube tray with raspberries and the raspberry lemonade mix, and set inside of the freezer, then move the remaining drink mix to the side for later. When everything is ready to serve, add ice cubes to each glass, and add a teaspoon of raspberry lemonade, followed by plenty of sparkling grape juice. From weddings and private parties to corporate events and non-profit fundraisers, Bash Divas brings a bash of inspiration to everything we do. We are full of passion and fun and love to work with clients as unique as the bashes we plan, from unique and customized concepts. Renowned for her warm, sophisticated, sensual and beautiful approach, Sarah Sekalala is a fresh new designer on the trend. Her signature style layers antique finds with contemporary cutting-edge materials. She combines objets d’art, luxurious fabrics, decorative patterns, textures and colours with her profound respect for architectural structure and detailing. Closed Saturday, Sunday and Public Holidays.